As part of an ongoing photo essay of sorts, I have been showing the working contents of various design and construction related professionals. 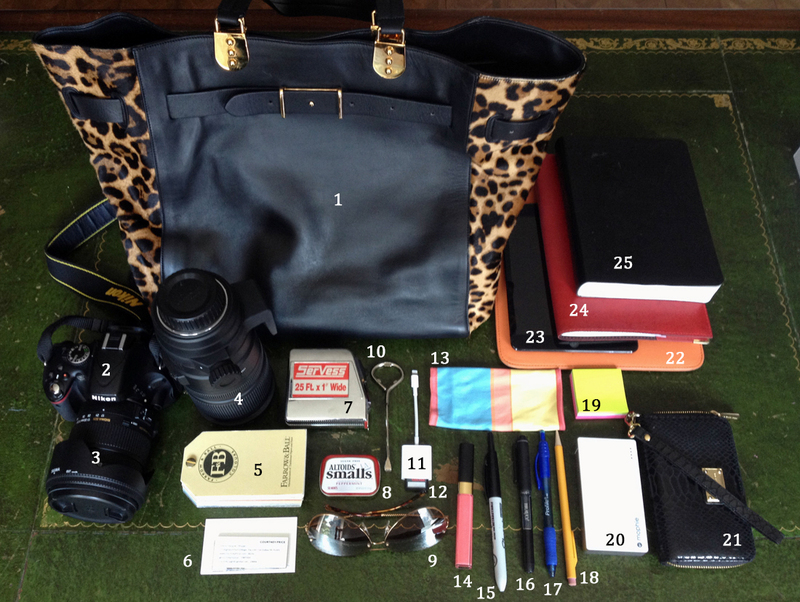 So far we have seen the bag contents from an architect, an architecture student, a dry wall contractor, and for today, we finally get to take a look at what’s exactly inside the bag of an interior designer. I’m always curious about just what exactly is inside those bags and I have a feeling that today’s post will contain the most stylish bag we will probably receive in this series. At the very least, a high bar has been set for other interior designers … but something tells me there are others willing to pick up this challenge. So there you have it, the contents of this interior designers bag … was it what you thought it would be? If you want any of these items for yourself – or maybe you just want to see what they might cost – Courtney was nice enough to send me links for a few of these items which I really appreciated. Sometimes it’s just easier to point someone towards the actual product information that try to answer the question at some point down the road. By the way, I’ve seen the “Apple Lightning to SD Card Camera Reader” and the “Mophie 2029” in action and they are some slick mamma-jammas. I think it would be sort of fun to see what other people – designers, students, contractors [I don’t need any more submissions from architects] – have in their bag. If you feel so inclined as to share, just send your pictures in to me and I’ll try and post it here on the site. All you need to do is copy the format I have above (don’t worry about adding the numbers to your image, I’ll take care of that for you. Take a picture of your bag closed, and then one with all the contents spread out on some surface, with a description of the contents. If your pictures are in focus, chance are extremely good that they’ll show up here on site. I think this could make for an extremely interesting photo essay.